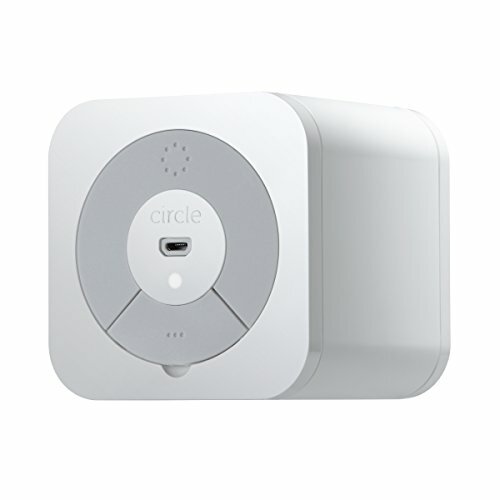 The Circle with Disney device connects to your home wireless router to give parents control over every device that uses the Wi-Fi. Although it is a simple, unobtrusive white box (only 3.25 inches cubed), it gives you options for filtering and setting time limits so you don’t have to worry about what your kids are doing online or how much time they spend plugged in. You also don’t have to spend time installing parental control software or apps on every individual device. We were impressed with what we saw in their product; read on to find out why. Summary : Circle with Disney is a solid option for parental controls on your internet with a sleek design and multiple levels of control from time to content filters. Dimensions: 3.25 x 3.25 x 3.25 in. Covers all devices connected to the Wi-Fi network without needing to install controls on each individual device. Simple setup takes only a few minutes. Set time limits by the person, app, or category. Pause feature can turn off the Wi-Fi in general or for an individual person or device. 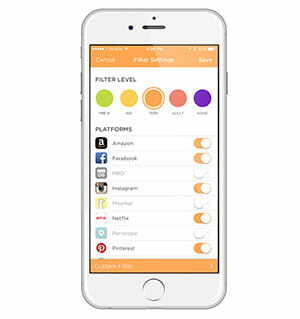 Filter levels can be set for every individual. Filter apps, websites, and content categories. Track and compare time spent online for each family member. Apply filters and time limits away from home with a subscription. Identifying devices correctly during setup can be time-consuming. Devices cannot be assigned to more than one person. Texting and calling don’t turn off during bedtime hours. Without a subscription, parental controls/filtering do not apply if you’re away from your home network. It isn’t compatible with all routers. Most filtering software either requires installation on your computer or involves downloading a parental control app on each of your kids’ devices. In contrast, the Circle with Disney works at the wireless router level, providing parental controls and internet filtering for every device all at once. Circle is not the only product to do that, but it is one of the only ones we’ve seen that doesn’t replace your home router or require you to install any new software. As a result, Circle is less expensive than other products and much easier to set up and begin using. This ease of use makes the product ideal for families with several people with multiple devices (laptops, tablets, phones, etc.) in the home. Once the Circle pairs with your home router, it automatically detects every device connected to the Wi-Fi, and you can begin creating profiles for each family member and assigning the devices to them. For devices that everyone in the home shares, such as a family computer or TV, you can set up a “Home” profile that applies to everyone when they use those devices. However, note that devices cannot be assigned to more than one individual, so if you have a device that two children share, you’ll have to go into the settings and re-assign that device every time it switches hands. It only takes a minute, but it is an extra step to go through. According to users, assigning devices is the most time-consuming part of the process for two reasons: first, Circle recognizes every device that connects to the Wi-Fi, including computers, laptops, tablets, phones, and smart TVs, so the list of devices can be quite long. Second, the names of the devices are often not very descriptive, making it difficult to guess which one is which. If you have other products that use the home Wi-Fi (such as the Nest Thermostat, smart door locks, a security system or cameras, etc. ), Circle should automatically add these devices to the unmanaged list so you don’t need to worry about them. When a new device connects to your Wi-Fi, you’ll get a notification on your phone so you can decide which settings to apply, which family member to assign it to, and how you want to label it. Not only are Circle’s parental controls very thorough, but they are also very flexible. We were impressed with the variety of options parents have when setting up each child’s profile and filter level settings. And we really liked that most of the features can be applied on different levels—by device, by individual, or generally. Time limits: Circle tracks each child’s total time spent online, regardless of the number of different devices used. You can set time limits for specific platforms and apps (such as Facebook, Netflix, Pinterest, etc.) or even for an entire category (such as blogs or the app store). You’ll get a notification when someone reaches a time limit, and kids can keep track of their time limits themselves through the MyCircle app. Most users report that hitting a time limit results in the app immediately disconnecting (sometimes to the protest of their kids), but others noticed that their kids’ phones switched to using cellular data to keep the apps and games connected to the internet. You’ll want to pay attention to those notifications when time limits are reached and see how the devices respond. If it becomes a problem, the Circle Go subscription (see below) can help. Bedtime hours: Once you set bedtime hours for a family member, every device belonging to that family member will disconnect from the internet during those hours. Not only that, but we liked that on the settings page, you can easily customize the bedtime hours for weeknights versus weekends for each child (and adult). The drawback is that anything that doesn’t require the internet, including calling and texting, is still available. You’ll need to look into an additional service to monitor those aspects of your kids’ phones. Pause button: During the day, you can hit the pause button and turn off the internet for individual family members during homework, dinner, or family time. You can also pause Individual devices (such as the TV), or you can pause the internet for the entire house. Each profile has a pause button at the bottom of the page and the results usually take effect immediately. Some users report a little lag time between hitting the pause button and the internet actually going offline, but that has more to do with your router and Wi-Fi connection than Circle. Beyond allowing parents to limit how much screen time kids get and decide what content to filter out, Circle provides parents with “Insights,” an accounting of how much time each family member spends online and where they spend that time. For each person, parents can see a combined browsing history for all devices, plus the five most-visited websites in any category. There’s a lot of information there, but if you are concerned that your kids are spending too much time on one site or app, this is a great way to keep track of that and see if you need to make adjustments to their time limits. The limitation of using Circle with Disney on your home wireless network is that your kids’ phones won’t be protected once they leave the house (or if they switch over to using cellular data instead of Wi-Fi). However, Circle offers a subscription-based service, Circle Go, that takes all the settings you’ve created for your family members at home and extends them to any network, including 3G/4G LTE, those devices might be on. Even if your kids are away from home, the same time limits apply to all of their apps and web browser time, and the bedtime hours will still take effect. Circle Go requires the MyCircle app, which can be installed on any iOS or Android device (check out the full list of compatible devices for details) but is not available for Android devices yet. The service costs $9.95 per month for up to ten devices with a 30-day cancellation window after signing up. One of the downsides is that the MyCircle app can be uninstalled fairly easily and your kids might take advantage of that, but you will get a notification if that happens. Another thing to be aware of is that Circle Go uses a virtual private network (VPN) to manage the activity on each device. Some streaming services (such as Hulu and Netflix) and some Wi-Fi networks (like those at schools) will automatically block any VPN. Circle with Disney gives customers a range of contact options, including a live chat, email form, and phone number. In our experience with the customer support representatives, they are very friendly, patient with long lists of questions, and knowledgeable about the product. We were particularly impressed with the helpful information and advice we got without feeling pushed into buying the product. More than one representative was able to answer all of our technical questions in a way that cleared up some confusion. Many other users have reported similar experiences, though there are a number of complaints that customer service was unhelpful and slow to respond when it came to getting a product replaced or fixed. The majority of user reviews are positive, specifically regarding the overall convenience and control of the Circle with Disney product. The small number of negative reviews tend to focus on technical difficulties and missing features; however, many reviewers mentioned that Circle with Disney has been proactive in listening to their customers and implementing suggested changes. Having a filtering and parental control system in place is not a substitute for talking to your kids and family members about internet safety, how to identify an unsafe website or situation, and what constitutes appropriate online behavior. However, Circle with Disney certainly adds a reliable layer of security to your home wireless network and therefore every device in the house. Any family that uses multiples devices—and that’s most of us, at this point—should consider using Circle with Disney, especially if you have tech-savvy, gadget-loving kids.